Today we’re going to make a Petal Pillow. Its very easy, cost me under ten bucks, and took about half an hour to make. Plus it will add lots of summer color (is it summer yet?) to your house. -a little over a 1/2 yard of fabric….19 inches to be exact. You can get away with a half yard if you already have it, just cut your pieces to 18″ instead of 19″. I used home weight fabric from Joann’s. – 1/4 yard felt. Buy the good stuff on the bolt and not the cheap sheets in the kids crafts section. The stuff I used is made from recycled plastic bottles and is really stiff and thick. This felt came on a 60″ bolt, but if the bolt is smaller you might want to buy a half yard just to be safe. – a large and small cup (or other circles) for tracing, a large bowl for tracing, a pen, scissors, and cardstock to make your template. Trace the rims of your cups onto your cardstock and cut out. Pin the templates to your felt and cut out circles. I was able to cut 3-4 circles at a time by folding the felt. Cut out roughly 30 large circles, and 20 small circles. You can always use more or less….but more the merrier I always say. Now cut your circles in half. Now your going to cut your fabric into three pieces. 1 large square 19 inches x 19 in. , 1 rectangle 19 in. x 15 in. , and 1 rectangle 19 in. x 12 in. Line up the edge of a large petal along the line you just traced. As you sew the petals on, overlap the petals about a 1/4 inch. Continue sewing around the circle, adding petals. When you get near where you started, put a petal in between the previous petals, so they overlap. Then you can start putting petals underneath the previous set. I lined up the straight edges of my petals only 1/4 in. or so underneath the previous petals because I liked them packed in there. Again…the more the merrier and the closer they are the better it will look. If you want extra volume in your petals, you can curve them and fold the edges as you sew to make the petals stand up a little bit. I started curving and bunching them a little bit on the third or fourth row. After you’ve done four or five rows of large petals and you’re getting close to the center, you can switch to your small petals. Again, as you get closer to the center you can curve and bunch the straight edge of the petals so they stand up a little and look like real petals. When you get to the center add a couple petals that are good and bunched at the bottom for extra volume. Cut a small circle out of felt about 1 inch, or large enough to cover your edges. Sew down with a few stitches in the center of the flower. Your done with the hard part…now lets make your pillow. Finish the short edges (12 inch and 15 inch) of your two back rectangles by folding one side under 1/2″ twice and sewing. Place your pillow front and back pieces right sides together, lining up edges. Put the larger rectangle down first against the flower right sides together, then put your smaller rectangle on top if it, right sides together. Pin well. Sew around the edges with a 1/2″ inch inseam. Because home decor fabric frays easily, serge or do a quick zig zag stitch around the edges. Trim your corners and turn inside out. Stuff with an 18 inch pillow form and your done! Yay! Es muy hermosa. Gracias para el paso o paso. You are a princess for giving us this tute..so sweet! I think i'll really make myself crazy and sew this by hand…thanks! Oh my gosh, this is amazing! Thank you for sharing!! It looked hard and you made it so easy.. Wouldn`t be fun on the front of a purse? Thanks again, Have a great weekend. Made one this weekend!! So cute and easy! Thanks for the clear instructions! Thank You so much for this tutorial – i tried it out and loved the result – posted a pic of it ony my blog! Hey, I made one cuz your's is soooo awesome! Thank you for posting this tutorial…it made making this not scary for me! Vi a sua almofada noutro blog e vim ver o pap da flor. Adorei o pap e o blog, repleto de sugestões e trabalhos lindos. Thanks so much for the pillow tutorial. I made some today and they came out great. the directions were great. I saw these for sale in a local boutique for 50 dollars! i am in love! i've seen this pillow at several stores and didn't want to pay the money for it…now i can do it myself. hooray! This is so pretty. I wonder what other flowers could be made. eee so excited to try this out for myself! Thank you thank you! I am adding this page to my home screen! I all of the stuff on the website are as good as this pillow, I am up for it! so, I had seen a really cool pillow at Jama's house and thought "wow, that is the coolest pillow Jama has ever bought!" Then the other day I was messing around on you amazing website and saw this great tutorial. And then next time I was at Jama's I checked the pillow. Sure enough, had your momma's tag on it :) LOVE IT! This is gorgeous! Wow, thanks for sharing! Will have to add this to my must-do list for sure. I'm your newest follower. i looove this! thank you, so much. what a beautiful pillow. Thank for such a great project. I am doing this with my kids. I totally LOVE this tutorial and ran across it the oher day. I made it last night and would love to link the tutorial to your blog if you don't mind. Keep up the creative blog, I love seeing quilting that's not so old. I love it,this is gorgeous what a beautiful pillow. wonderful instruction. I can't wait to do more. Just made this today with your tutorial!!! It is wonderful! I added it to your flickr group. My daughter has been eyeing these at pricey stores like Pottery Barn. $25 or more!!! She wants an orange and a hot pink. I will be doing the orange one this week. Thank you so much!!! Thank you for sharing! I can't wait to try this out! I just got a sewing machine for Christmas and this is definitely going on the To Do List! This is great! I will for sure have to try this! I love the pillow, but didn't want to make an 18 inch pillow so I scaled it down for a 14 inch pillow. Thanks for sharing this tutorial. I can't wait to try this! Thanks for sharing. Thanks so much for the cute idea and wonderful tutorial. I made one for my daughter. It turned out great! Great tute -can't wait to make a few!! Thanks for the awesome tutorial! So easy to follow!! Thank you for this wonderful tutorial! I am now officially obsessed with making these pillow covers. I posted a picture of my results on my blog http://livingcreativelife.blogspot.com/2011/03/new-pillows.html. I included a link to your tutorial and blog. Thanks Again! Thank you, it's a very good idea ! Just finished this pillow. LOVE IT! Thanks so much for the tutorial! I think your pillows are pretty great! All of them! I am new to sewing and can't wait to try your sprocket pillow! Will you please consider joining the Pillow Fight? And is there any way I can get you to guest post the sprocket pillow tutorial over at my blog to encourage people to join the pillow fight? This is a lovely cushion, am going to make it. Thank you, thank you. gorgeous pillow. just made one for a friend and i love it. (going to be hard to part with!) the perfect pop for any room! At first seems, it looks hard, but you done it very easy. Mine took a little longer than 30 minutes, Your tutorial inspired me to make my own version with various techniques. Love it thanks for making out so simple.. I originally found this post as a guest post from V & Co. I have to say… thank you for such a detailed post! I FINALLY got around to posting the steps of me following your amaze tutorial on my blog here. Thanks again! My friend loved the pillow. I think navy and teal or navy and yellow scheme next? Thanks again! FABULOUS tutorial!! Thanks for sharing. This is really neat. A must try for me. Thanks for all the good stuff and great ideas. I'm using this tutorial to make one of these for my daughter's nursery! It sure beats buying one off of Etsy (though I love Etsy)for $40! Thanks for this tutorial! I love the look. My next project is another one with maybe 2 or 3 smaller flowers in the same style on one pillow. I Absolutely loved your pillow and it´s so much easier than I thought it was to make it. I´ll try to make one myself. Thanks so much for this tutorial! I made two of these pillows for my room, and they turned out wonderfully! Thank you for sharing! This was a fun project and I'm so happy with the country sunshine-y feel of the one that I made. Thanks for the great tutorial! I am definitely going to try making one of these! OMG!!! I thought this was going to be so hard to do but your instructions are so clear. And you simplified it so very well. Thank you so much I cannot wait to do this. I love it I love it I love it! Definitely want to give this project a go. 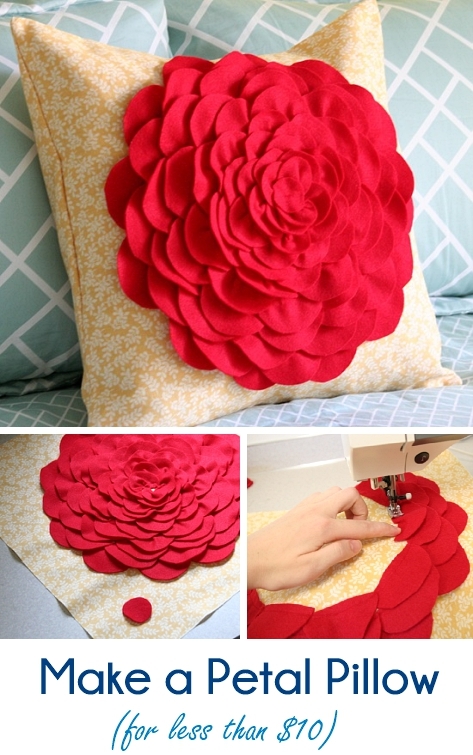 Thanks so much for the tutorial – your cushion looks absolutely delicious! I am risking sounding like a total dork here – after the first round, do you put the petals 'over' the existing round, not underneath it?? So fun!!! I am making one today, would be great for Christmas decor too… and your stocking tutorial is so great!! I've made two already!!! Thank you for sharing your talent and inspiring creativity!! Wowwww, great tutorial!!! Thanks you for sharing us! What size fabric pieces would I need if I have a 19.5″ pillow form? Thank you! Hi Kelly, Just add a half inch to each of the measurements given and you should be fine. Even if you used the measurements as they are, it would still fit and just be a full pillow. Thanks for such a quick reply! I Love your petal pillow!!! I’ve been looking for something to do with my mom’s clothing that no one wants (she recently passed away) and I’ll give these lovely pillows to my family members as a keepsake. They will be so thrilled! Thank You!!! Thanks for sharing, I think I can actually make this. Any suggestions for the best backing (first round circle) for all those layers?